Customer Reviews Cold Lake | Testimonials | Cold Lake Consulting Inc.
At Cold Lake Consulting Inc., our mission is to help homeowners prepare for their renovation project by providing advice and information every step of the way. Whether you’re re-flooring your entire house or putting up a couple of new walls, we’ll make sure that you have everything you need to get the job done right. On this page you’ll find a selection of testimonials from our previously satisfied customers. It was so nice to have someone to call for advice on renos or new construction like Randy. His knowledge and experience were worth it, it opened up a whole new perspective on what my wife and I were trying to achieve. He even offered to come back to show us things if we were stuck on how to do something. Gotta like that, sure is nice to know that Randy is only a phone call away. Once again thanks for your help and advice. – Cory & Lana P.
Randy - Just a quick note to say thanks very much for the information I garnered in our consultation. I am much more knowledgeable about what my backyard needs are. I now have ideas of who to contact and what materials to purchase or not purchase as there may be cheaper alternatives. Thanks again for sharing your knowledge with me. – Lorie J.
I first met Randy MacDonald in late 2006 when I was in the process of looking for rental accommodation in Cold Lake. Rentals at that time were scarce so I was very persistent in pursuing the apartment that Randy had available and was successful in renting from him. I remained in that apartment for 2 years and maintained an amicable tenant/landlord relationship with Randy, and when another of his rental properties became available he suggested that I consider moving as it would better suit my needs. I did move and over time we progressed from being simply landlord and tenant to friends. With help and advice from Randy I was able to purchase that house in 2011 (a move that I likely would not have made without his guidance). In all my dealings with Randy, both business and personal, I have always found him to be upfront and ethical in our discussions and transactions, and although we are no longer doing business together we remain friends and meet regularly for lunch, coffee or if I just find myself needing advice and someone to talk to. I would not hesitate for a moment in entering into another business relationship with him and am pleased to be able to count him among my close friends and mentors. – Sincerely, Dan W.
Hello Randy. I wanted to thank you for coming by the day I called. I was having issues in one of my bathrooms and you were at my house in under an hour. You advised me on how I could handle the problem myself and gave me recommendations on who to call for further assistance with the specific problem. I apologize for taking so long to thank you. Much appreciated. – Diana W.
I would like to acknowledge a wonderful entrepreneurial effort in Cold Lake that I had the pleasure of coming to know recently. As a homeowner of one of the many new builds in Cold Lake, we found ourselves with a large basement “left to our imagination” as many of these new homes are. Now I consider myself a pretty handy guy, plumbing, electrical and doing some construction, etc. So all should be well – or so I thought. Sounds easy enough, put in a couple of walls for a bedroom, bathroom etc. Now try to draw that—yes, a little more difficult. I know that I just need to get started and then I knew I would be able to do the actual work. 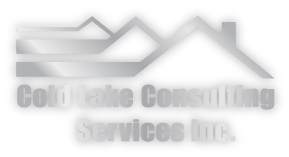 Well fellow do-it-yourselfers; there is a wonderful solution, Cold Lake Consulting. Randy came over and helped us plan a design of how the bathroom should be laid out as well as the other rooms. What fantastic ideas! I would have never thought to move a wall in order to utilize other space for a much larger bedroom closet or the way a door should open in a room and where it should be placed. The ideas just flowed and we were left with concrete plans mapped out for us. Now we are left to start the work, with an approved permit of course, which incidentally, Randy helps with too. Once we are done with certain stages, Randy will come back and ensure things are done properly and help us with the next steps. With Randy’s help I was able to order the supplies needed, and get started on the actual work. I would have loved to been able to hire a contractor to come in and do all the work for me, but there is no way I would have been able to afford such a project for at least a few more years. At a fraction of the cost, and a lot of sweat equity, I will be able to enjoy a completed basement. Thank you, Randy. – Chris E.
I can see clearly now. Thinking about a major update and reno of a two-story condo and a head full of ideas. After a home visit from Randy everything started to fall into place. Knowing how difficult it is for the average person to co-ordinate, plan, research, find contractors, suppliers; and to do this in Cold Lake seemed almost impossible. Randy knows this world and can help find the right person to do the job. With his years of experience and his very sharp eye for detail and innovation, he easily answers all questions, offers his unbiased opinion on reno plans, and puts on the table answers to problems before they occur. He can lay out a "map" of sorts, putting in the proper order your entire project, thus simplifying and taking the fear of the unknown out of the picture. Randy is experienced, insightful, and constantly on top of trends. A pleasure to work with. Let's get started. - Candy and Don B. With our situation, my husband was not able to do the work himself (we needed someone else to set up a cement pad at the side of the porch for his wheel chair lift to sit on). For months, we had been looking for a contractor or renovation company to build a cement pad for our wheel chair lift and had no luck, as it was either too small of a job or they were too busy. So we called Randy and explained our situation, and he came out the same day, made some comments and recommendations on what needed to be done, and then found a crew to come out and complete the work the way we needed it done. Randy came out to inspect the work several times to make sure that we were satisfied with the work that was being done. The work that was performed was of the best quality, and after so many months, my husband again has the freedom of coming and going from our home. Without the help of Randy and his crew of people that did the work, the job would probably never have gotten done. Thank you very much Randy. – Kathy & Bill J.